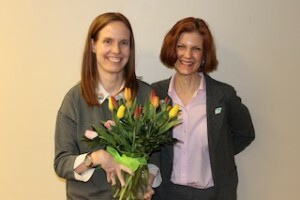 Two staff members earned Carnation recognition and Bouquets of Recognition. Facilities Coordinator Mark Wagner was honored for his concern and quick action when a colleague suffered an unexpected medical emergency. 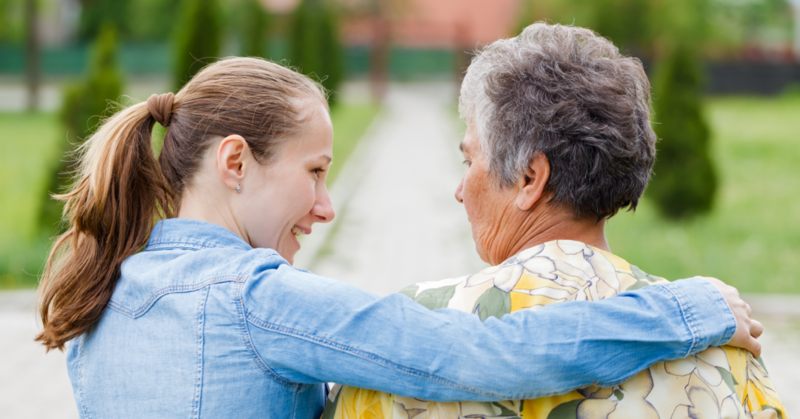 “Thankfully, Mark recognized that she clearly wasn’t feeling well…and insisted that she go with him to the shift leader office and meet with nursing staff just to be safe. Mark’s quick action in getting her to the shift leader’s office so she could receive additional assistance probably saved her life that day.” Also honored was Landscape Assistant Noah Stomps for stepping up to new responsibilities in recent months. 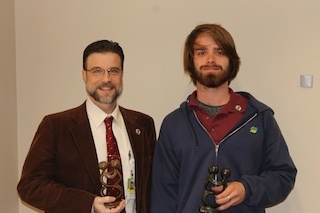 Noah demonstrated willingness to go “above and beyond his duties the entire season to make sure the grounds at Ohio’s Hospice of Dayton look exceptional,” the nomination notes. 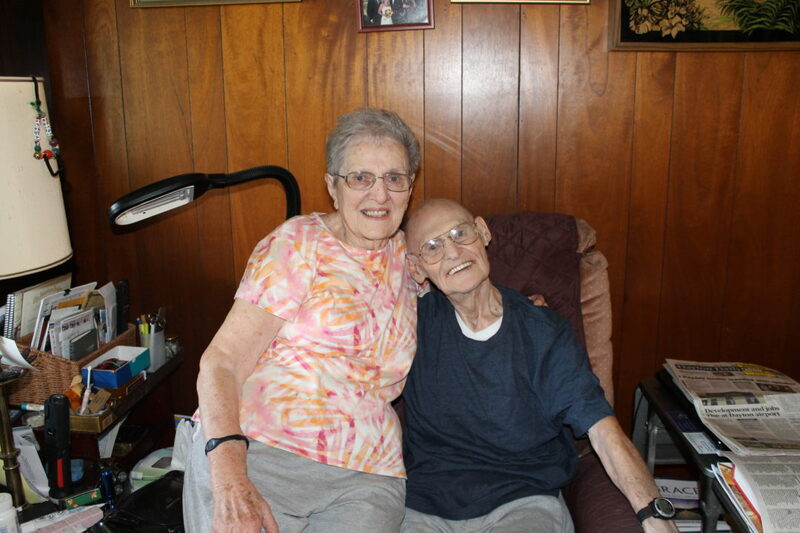 “Noah is an asset to the landscaping department” and reflects the values of the Hospice mission. Thanks to both worthy recipients for all they do! Mark is pictured left and Noah on the right. 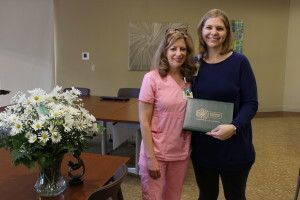 Bereavement Counselor Lisa Conn was surprised with the Tulip award in appreciation for her dedication to addressing the needs of those in grief. “Lisa has been helping a group of Jamestown adults and young adults deal with a tragic death of a 14-year old young man,” the nomination explains. “She is great at her job! Everyone looked so forward to our meetings with her and she went above and beyond making her schedule work with our crazy schedules…Thank you, Lisa, for being you…you have been given a wonderful gift.” Lisa is pictured left with Director of Care, Patient Family Support Services Lisa Balster. Crisis Care RN Suzanne Jackson earned DAISY Award honors in appreciation of her exceptional care and attention to patients. “Suzanne was recently caring for a Coming Home patient who was very aware of her appearance, had been very outgoing and involved in the community and had many friends who came to visit. The day of her death, Susie applied the patient’s make-up and lipstick, adorned the patient with a lovely scarf and told her how beautiful she looked. 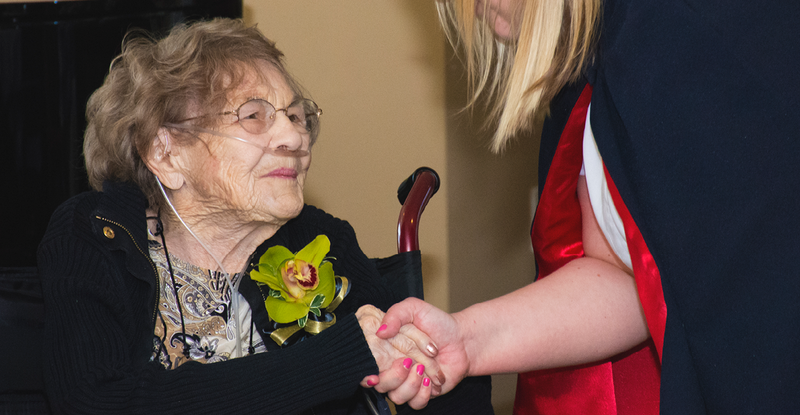 She provided loving support to all visitors and family while providing exceptional care to the patient. Suzanne exhibits Ohio’s Hospice core values with the care she provides and is a great asset to our team.”Suzanne is at left with Crisis Care Manager Kristy Brock. 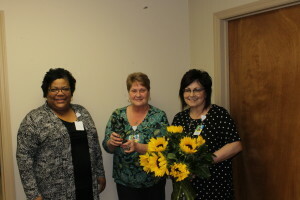 Personal Care Specialist Dianna Irven was presented with the Sunflower Award for her dedication to patients and collaboration with colleagues. A co-worker said, “I always know I can call Dianna if she is familiar with a patient, because she is more than willing to help and let you know all the details so that the visit goes smooth for you and more importantly for the patient … Diana always has a smile on her face and a great way with her patients and coworkers. I appreciate all the help she has given me anytime I have ever needed to call her!” Dianna is pictured, center, with Team Manager Jayne Ormberg to her right and Director of Care Yvonne Turner at left.